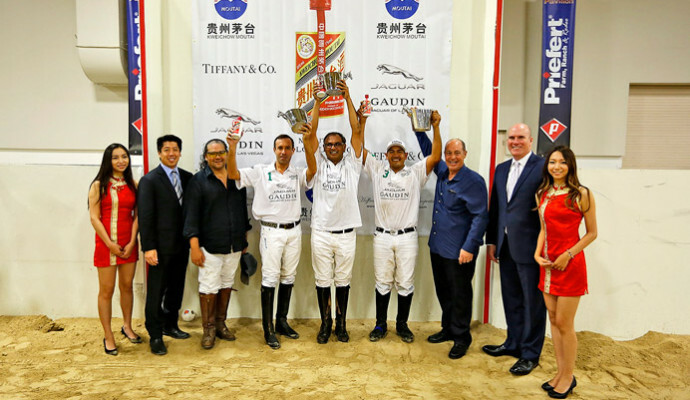 The Moutai Polo Classic is the premier arena polo event of 2015. Some of the best arena polo players competed at the Priefert Pavilion at the South Point Casino & Equestrian Center in Las Vegas. The excitement was fast and furious in the unique and intimate arena, every seat was within a few feet of the players and horses. In addition to the thrill of watching the Sport of Kings, guests also enjoyed a fabulous brunch and a formal dinner. To experience the sport of polo, guests had the opportunity to play Golf Cart Polo – the professional polo players drove the carts while the guests stroke the ball with short polo mallets!